In How to Live and Not Die, Norvel Hayes reveals just how important it is to the heavenly Father that His children walk in divine health. God's Word has specific promises for believer's regarding healing, and Hayes shares in this life-transforming message how readers can fight for their health and their life with God's Word. Readers will learn the importance of worship, how to pray effectively for healing, specific Scriptures to stand on, how to take authority over sickness, and more. - Publisher God does not want you to be sick. Health and healing continue to be areas of great need for people everywhere. People across the globe have been healed through modern medicine, doctors, and surgery, yet thousands still suffer with incurable diseases to the point of death. ^ God's Word has specific promises for believers regarding healing. In this life-transforming message, How to Live and Not Die, Norvel Hayes reveals just how important it is to the heavenly Father that His children walk in divine health. About "How to Live and Not Die"
God does not want you to be sick. Health and healing continue to be areas of great need for people everywhere. People across the globe have been healed through modern medicine, doctors, and surgery, yet thousands still suffer with incurable diseases to the point of death. ^ God's Word has specific promises for believers regarding healing. 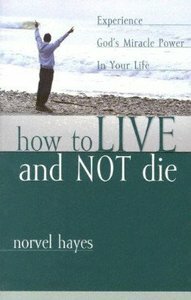 In this life-transforming message, How to Live and Not Die, Norvel Hayes reveals just how important it is to the heavenly Father that His children walk in divine health. Norvel Hayes is a successful businessman, internationally renowned Bible teacher, and founder of several Christian ministries in the U.S. and abroad. Brother Hayes founded New Life Bible College, located in Cleveland, Tennessee, in 1977. New Life Bible Church grew out of the Bible school's chapel services. The Bible school offers a two-year diploma and off-campus correspondence courses. Among its many other outreaches, the church ministers God's Word and hot meals daily to the poor through New Life Soup Kitchen. Brother Hayes is also founder and president of New Life Maternity Home, a ministry dedicated to the spiritual, physical and financial needs of young girls during pregnancy; Campus Challenge, an evangelistic outreach that distributes Christian literature on college campuses across America; Street Reach, a ministry dedicated to runaway teens located in Daytona Beach, Florida; and Children's Home, an orphanage home and education center located in India. Known internationally for his dynamic exposition of the Word of God, Brother Hayes spends most of his time teaching and ministering God's deliverance and healing power in churches, college classrooms, conventions, and seminars, around the world. Visit the author's website at: www.nhm.cc.